Active shooter incidents are increasing at an alarming rate, and although they occur mostly in public places, at businesses, and in schools, they can happen anywhere, at any time – including in a healthcare facility. These incidents strike suddenly, without warning, and people are usually stunned into inaction. Being mentally prepared will help you to take action immediately on the “Run, Hide, Fight” continuum and could save your own and other’s lives. An active shooter incident is defined as a situation in which the attacker is “actively engaged in killing or attempting to kill people in a confined and populated area.” The gunman does not come to the area with the intent to commit any other crime. Most often the incident is over within 10-15 minutes, even before law enforcement arrives. This emphasizes why it is essential for ordinary people to know how to react. Chaos and panic usually characterize the scene – there is noise from gunshots and alarms, people are running and screaming. Even those who are trained initially experience the typical human reaction to fear and anxiety, often combined with disbelief and denial. Many of those who have suffered active shooter incidents say afterward that they didn’t know what to do or that they were just waiting to take the next bullet. Knowing how to react provides the mental preparation needed to gain self-control, recall some of what was learned and proceed to action. A single individual taking the lead can contribute significantly to their own as well as others’ chances of survival. The essence of action in an active shooter situation is to respond immediately with run, hide or fight – in that order. No one situation is the same and the specific circumstances, including on how close you are to the shooter, will determine the choice of action. One might not make the best decision, but any action is better than doing nothing. The idea is to run away from the shooter wherever possible and to encourage others to do the same. Assess exits and have an escape plan in mind. Encourage or help others to escape – a forceful call of “Follow me” or “Gunshot! Get away!” can be used to pull bystanders out of their inertia. However, don’t get caught up by anyone who chooses not to follow and don’t try and move persons who are already wounded. Leave personal belongings behind and keep your hands visible while moving. You can call 911 once you are in a safe space. If you are unable to evacuate the area the next option is to try and hide away where you will be out of the shooter’s view. Ideally, look for a space where you will be protected if shots are fired in your direction, for example behind a door or a piece of furniture. Wherever possible get into a room and lock the door, which can also be barricaded with heavy furniture. Remain quiet and avoid any noise by putting phones on silent and turning off any radio or television. You can dial 911 if it is safe, even just leaving the line open if you cannot speak. This will assist law enforcement in locating the shooter. The last resort, if your life is in immediate danger, is to fight. Try to disrupt or incapacitate the shooter by acting as aggressively as possible towards him – yell, throw heavy items at him or even try and take him out with makeshift weapons. 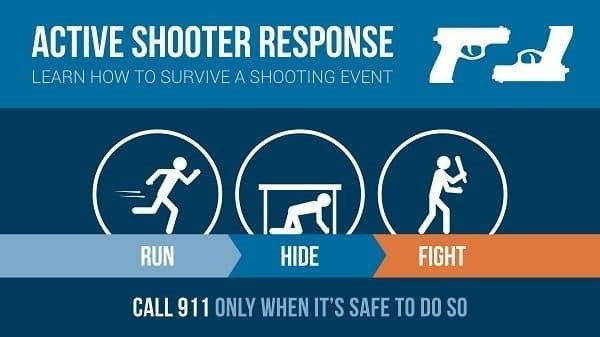 While this advice appears counterintuitive, your chances of survival if you can’t escape are much greater if the shooter can be distracted or taken down. Co-operate with law enforcement officers once they arrive. Their priority is to stop the shooter as soon as possible. They could appear aggressive – they are armed, may use pepper spray or tear gas, shout commands and push people around. Follow the officers’ instructions and answer their questions promptly. The information they need is the location of the shooter/s, how many there are, and the type of weapons if known. Don’t try and get information from them, expect them to guide you or to attend to the wounded. Put down anything you may be holding in your hands, even bags or jackets, raise your hands and keep them visible. Injured people can be attended to once it is safe. 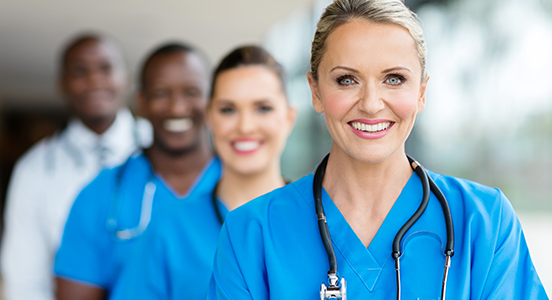 As a nurse, you could provide life-saving assistance, such as quick hemorrhage control, while waiting for emergency medical staff to arrive. Bear in mind that once the shooter is incapacitated or arrested the location is a crime scene and nothing should be moved or touched except in relation to helping the injured. After initial treatment, casualties are usually moved to a central assembly point where a mass casualty plan will be implemented. Here you can also help in line with your knowledge, training, and skills. 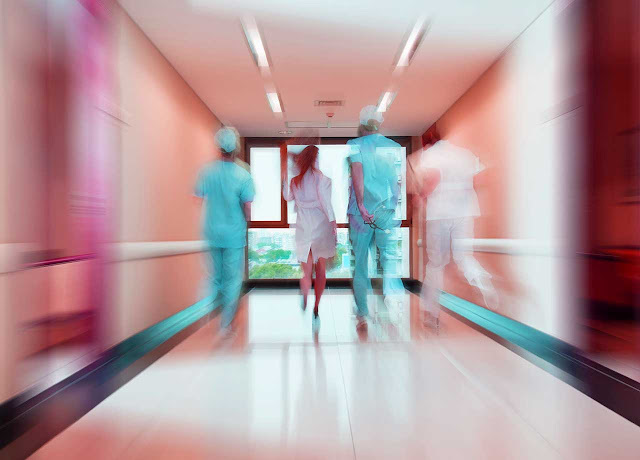 Every healthcare facility is required to have an emergency action plan, and most of them conduct training exercises to prepare staff for emergency situations. These exercises are often limited to evacuation drills in the case of fire or bomb threats. The current reality, however, also calls for activities to prepare staff on what to expect and how to react in an active shooter situation. Arrangements can also be made with one of the various agencies to provide staff with active shooter preparedness training.